We’ve approached the time of the semester where professors start giving out their first essay assignments. Sure, you saw it during syllabus week, but you never thought it would be here this quickly. You haven’t even started that semester gym routine you’ve been researching. I took some time to interview student writing mentor Kathryn Harlan-Gran about tips and tricks she has for handling your first college essay (and every essay afterwards). Kathryn has spent four semesters working at the University of the Pacific Student Writing Center (SWC) located on the second floor of the library. The SWC offers peer-to-peer assistance for written assignments, whether that be your first PACS essay or a personal letter for a scholarship or even a major research project. The tips provided below relate to the SWC experience but can be adjusted to fit all of your needs, wherever and whenever you decide to seek writing help. 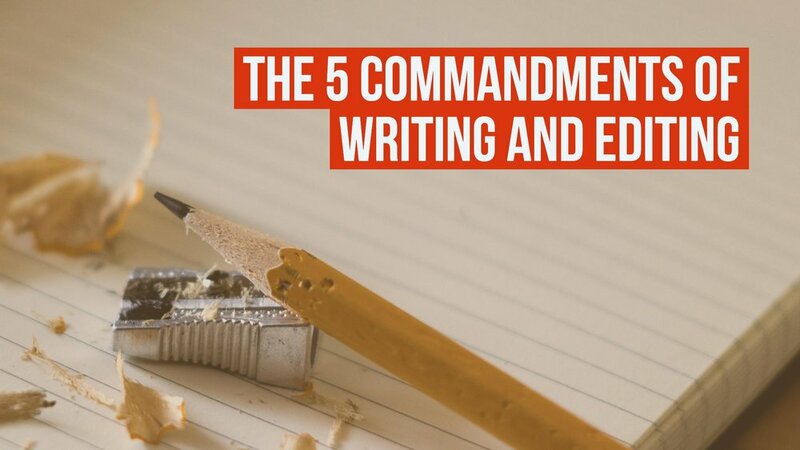 Without further ado, here are Kathryn Harlan-Gran's 5 Commandments of Writing And Editing (Your First College Paper). I understand the inclination to not start with the thesis because sometimes it can be the hardest part; you’re trying to sort of blend everything you feel about a subject into one or two sentences and that’s tough. If you write your paper and then try to come back to the thesis, you’re going to end up with a paper that’s scattered. A thesis is meant to guide the direction of your writing and doing that first means the rest of your paper has a jumping off point that it can grow from. My favorite way of outlining is simply starting with the thesis and then listing topic sentence ideas. 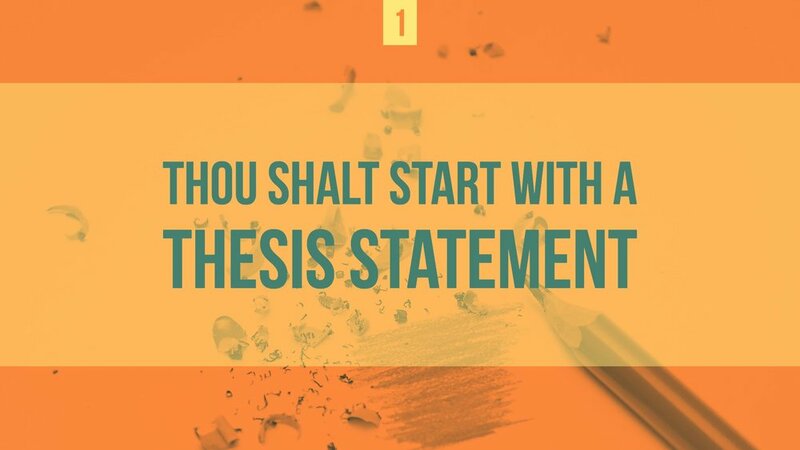 The purpose of a topic sentence is to demonstrate, in specifics, one element of your thesis statement while still being clearly connected. 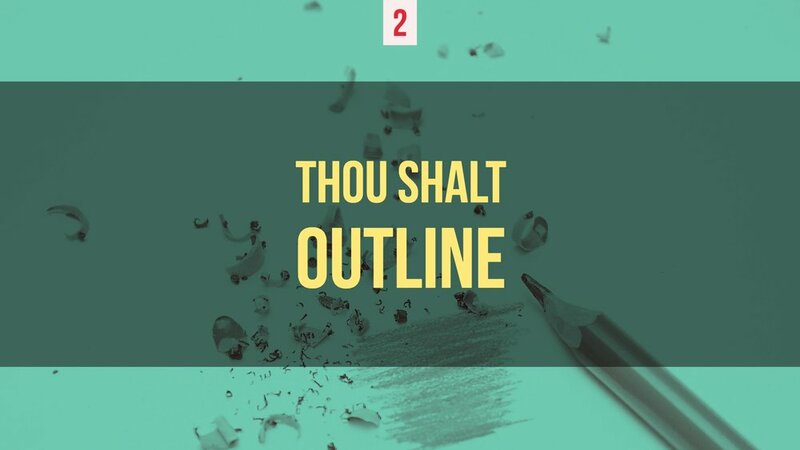 By creating an outline ahead of time where you lay out each of your topic sentences, you’ll be able to clearly see how each paragraph in your paper connects back to that main idea you started with. Author's Note: There is a misconception that outlining is only for young writers. It’s not. Don’t believe me? J.K. Rowling mapped out her plotlines and she's definitely a success. Even before taking it into the Student Writing Center? Especially before taking it in to see us. Our function is to look at larger subjects in the paper such as your thesis statement, your topic sentences, and your transitional statements. Those are the things we want to be able to look at during your session and it’s hard to focus on those things when you come in with a paper that is riddled with grammatical errors. You will always, always catch something if you sit down and proofread, I guarantee it. No matter how strong a writer you are, if you sit down and take the time to proofread you will find something that you can fix. My personal recommendation is proofreading aloud. When you read it out loud you’re forced to slow down, you’re forced to think about the way in which you said things and you are way more likely to hear errors than you are to see them. A surprising problem is people come in and they’re just convinced that their work is terrible. They actually have very strong ideas and they just need a little help working out how to say them. If you go into any project assuming that what you’re doing is bad or assuming that someone else will say it better or has said it better, then you’re setting yourself up to fail. Be comfortable with your writing and don’t make apologies for your writing even if your grammar isn’t perfect. Recognize that your voice is valid and your voice is important and the way in which you articulate your ideas is not in anyway wrong. What we aim to do here at the Student Writing Center is not to go in with a red pen and tell you all the things you’ve done wrong, but rather find the very best ideas you have in your paper and give our perspective on how you can frame those ideas in a way that communicates everything you have to offer to an audience. We work with all stages of the writing process, all backgrounds, all majors, all levels of experience. Even if you think you’re the best writer on this campus, you can always gain something from getting a new perspective. College is an awesome opportunity to build a community of thinkers. All kinds of people around you have the resources to help you articulate your thoughts and I don’t think anybody should be afraid of reaching out to people. On campus and looking to follow through with commandment five? You can book an appointment through pacific.mywconline.com. Prefer to schedule things over the phone? (209) 932-2969. Email mhash@pacific.edu if you have any Student Writing Center questions or want to schedule an appointment through email. Drop ins are also welcome on a space available basis.